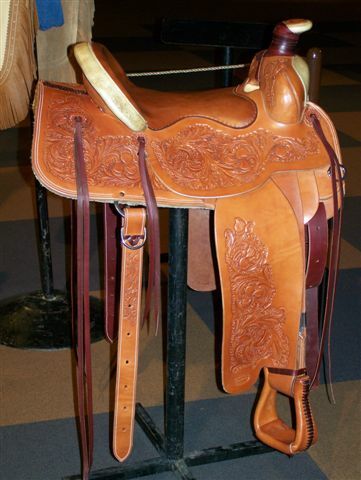 This saddle is styled after the Monte Foreman balanced ride that Slim Fallis built for many years. It provides close contact to your horse and a ride that places you in motion with your horse. A very comfortable saddle to ride. Meeker, Colorado is in the heart of Scrub Oak country. The Oak leaf and acorn were adapted into the carving of this saddle. Back to Klenda Saddlery Saddles Page.